The EMU women stretched their winning streak to six games Wednesday, sweeping a pair of non-conference games from Mary Baldwin in Harrisonburg. The Lady Royals are now 9-5 overall with four of the games from the winning streak being mercy-shortened contests. The women scored once in the first, but broke through in the second. Courtney Allman (Mt. Solon, VA/Fort Defiance) brought in three with a bases loaded double to push the lead to 6-0. The Fighting Squirrels got their run in the top of the fourth, but Eastern Mennonite put up four more in the bottom of the frame. Allman ripped another double which brought in two runs, and Aislinn Lucas (Grottoes, VA/Fort Defiance) followed with an RBI double of her own. Reigning ODAC Pitcher of the Week Jordan Aylor (Madison, VA/Madison County) struck out six batters in her five innings of work as she improved to 5-1 on the season. Allman led the offense with her two doubles and five RBIs. Cheyenne Cash (Elkton, VA/East Rockingham) also had a pair of hits, scoring twice and driving in another run. Brooke Hensley (Elkton, VA/Spotswood) and Brooke Sigrist (Crimora, VA/Fort Defiance) each scored twice as well. Game two was scoreless until the bottom of the third. Cash led off with a single and Sigrist also singled with one out. Allman followed with a two-run double. A third run scored on a passed ball as EMU jumped ahead 3-0. 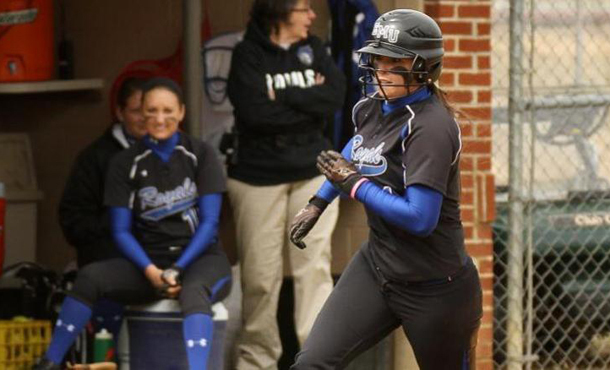 Mary Baldwin scored an unearned run on a two-out double in the fourth, but the Lady Royals kept coming in the fifth. The first four batters had hits, including an RBI single from Lucas and a two-run double from Angelia Miller (Bridgewater, VA/Turner Ashby). Molly Smith (Elkton, VA/Spotswood) added a two-out double to the push the edge to 7-1. MBC went down in order in the top of the sixth, and the women triggered the eight-run mercy rule in the sixth, as Lucas and Miller had back-to-back RBI hits to plate two. Lauren Campbell (Stuarts Draft, VA/Stuarts Draft) got her first career start and earned the complete game win. The freshman gave up just two hits and one unearned run. Miller finished 2-3 with a walk and drove in three runs. Allman was also 2-3 with a walk, and added two RBIs and two runs. Lucas had a pair of singles with two RBIs while Sigrist also had two hits and scored twice. Eastern Mennonite stays at home for two more doubleheaders this weekend, hosting Mary Washington on Saturday and then No. 23 Roanoke on Sunday.